If you are playing on a consistent basis and have a piece of paper in front of you to make some notes it's pretty easy. Mostly you'll also have different Corps doing the same thing at the same time anyway. For example when you launch an offensive I doubt you're sending only one division to take the objectives. @Ithikial : How much do you use the Commander's Report? When I first had a look at it I was overwhelmed by all the information and options. But the more I get into it, it seems like you can do a lot with it and as long as you learn how to cherry-pick the needed info or options it is an essential tool. Not as much as I should I admit. Keep forgetting where it's located under the complex UI. Guys, WitE recently updated, so if you have not you might want to! This baby is on sale on Steam this instant. They´ve knocked seventy percent off. From 73 Euro to 22! This is my first ever crack at the full campaign. I have been playing this game since Feb 2017. In 1941, there was lots of encirclements. Leningrad was surrounded but I did not isolate it completely because of the Lake Ladoga "highway". I made it right to the gates of Moscow but couldn't take any parts of the city. In the south, Kiev fell and I pushed right to Rostov on the Don but couldn't take it. The 41/42 winter was hard on my troops and on my resilience. We were pushed back everywhere but held the Volkov line. The Romanians could not hold the line in the Ukraine and the 6th Army south of Moscow had a very rough time of it. At times my Panzers had to line the front defence and/or fire fight the Soviet advances. As my line started to straighten out it freed up a few of them. This allowed me to refit some of these units and some of the battered infantry divisions which were down to 35% TOE. The plan, following the winter, was that the majority of my Panzer forces would be pushed north with the aim of trying to encircle the Volklov line, isolate and take Leningrad. If that went well then I might push for Moscow. After the winter ended there are a few clear turns in between mud turns. My thrust to cut off the Volkov line stalled and several encirclement's that I made had to hold out during these mud turns. A couple of the aggressive Panzer divisions were encircled but managed to hold out. Now in mid July 1942, I think the mud is done for a while. The Soviets lines have fallen apart in the south and they only hold strong in the Crimea and around Moscow. I have broken into the outer suburbs of Leningrad and might bag a couple of armies east of the Volkov River (plus those in Leningrad). In the south, Rostov on the Don in about to fall. If you look at the screenshot the stats in the bottom right, their many power is actually less than the total Axis manpower. I think I might have them, I just don't know how many reinforcements they will get during the summer. Take Moscow you'll win by the next winter. For some reason I am playing the Sudden Death Campaign (note sure why I chose this a year and a half ago). Maybe it will end earlier. They are still throwing a few hard punches though. That game just looks sick as hell! It´s a must have as soon as ones IQ goes up a dusin. Yeah it's really deep but still enjoyable just knowing the basics. Yeah, its a great game. Takes a while to get into it and it is time consuming. I started keeping some key notes on certain game mechanics so that it was easier to pick up when you do not get back to it for a few months/years. 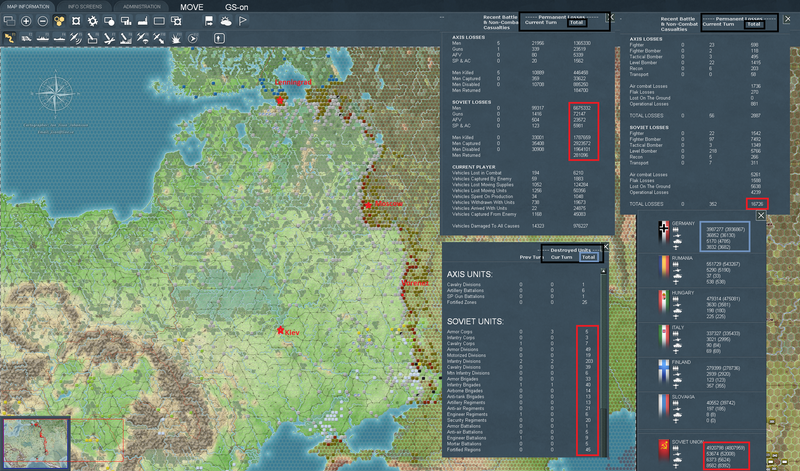 Also I try to us a systematised turn order (Recon, Anti Partisan, Rail repair, Together [start in the north and work south with unit movement and attacks, Rail movement, checking Core zones for supply and re-assign units], air supply, bombing and then move air units). This helps as you do not want to miss rail repair (especially in 41) and you can save half way through a turn and get back to it after a few months without to much trouble. In the game I have now taken Leningrad and Moscow. Very happy, this feels like quite an achievement after so long and getting through that first winter. Russian casualties (incl captured) are pushing above 8.5 million. Their manpower has now dropped to the equivalent of Germany's alone. Tanks and Artillery numbers are pushing towards parity. Continuing to push east around mid September 42. Gorky, the Don Bend and maybe western Caucasus could be a possibility before winter. It should be added for those interested in the game is that there are some (especially with the module) smaller scale scenarios to play if time is limited or for learning the game. 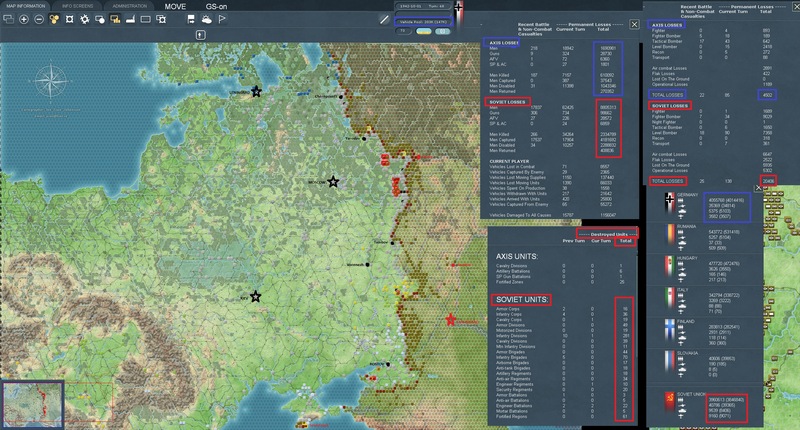 Not all is full-Barbarossa or even 41-45 scenarios. One thing I haven't got into the habit of using yet, are the administrative points and when to change commanders using them. Or is it recomended to just play single player? I can only speak on the Soviet AI during the various Barbarossa scenarios and the current game I am in when it is mostly defensive AI. After about Sep 41 it is quite good at keeping its front together and avoiding encirclement's. Sometimes it will abandon a major city to do this which may or may not be a good decision. In the winter of 41/42 in the current game I am playing the AI was on the offensive and pushed me back on a broad front in the South and to some degree in the Centre. My lines in the South were close to cracking but I managed to hold them together. It usually attacks where it has a significant combat advantage. Attacks may be "coordinated", that is they generally fall out in groupings but i am not sure of this yet. There were no deep encirclement's of my troops which may mean that the AI does not know how to exploit a gap in the line, I am not sure yet. I have only played against the AI. Agreed, the smaller "Road to" Scenario's are a great way to learn the game. Road to Minsk is only 3-4 turns and you get to unleash the Panzer's and have a lot of fun. You can knock this scenario out quite quickly. There is also a tutorial PDF document which steps through Road to Leningrad which i found quite informative. Yeah that's when you find yourself read the Matrix forums and come across many aspects of the game that are mind boggling, as the Soviet player, when is it the right time to move the factories etc..
I´ve read somewhere that you can even execute your own officers. It apears to have more or less all elements of war in it, I hope. One year and nine months in the making. What a game. 10 October 1942. The Wehrmacht push hard towards the Soviet cities of Gorky and Saratov. In the south Sevastopol and the oil rich regions north of the Caucuses Mountains are under threat. Only the Stalingrad Front holds strong. With a further 12 Divisions and 10 Corps (Tank and Cavalry) surrounded west of Gorky, the Soviet regime collapses following the falls of Cherepovets. One year and nine months...to play!